Disclaimer: I am not a trained electrician by any means, but I was able to install a new motor with a variable-speed control. If you want to try installing the motor yourself, I can’t be held responsible if it doesn’t work out for you as it did for me. I realized in my earlier post that there were some items I forgot to mention that I need to buy before installing the motor and the VSD. I bought these items at my local hardware store, I think in total it was around $80 US. The tools I already had. 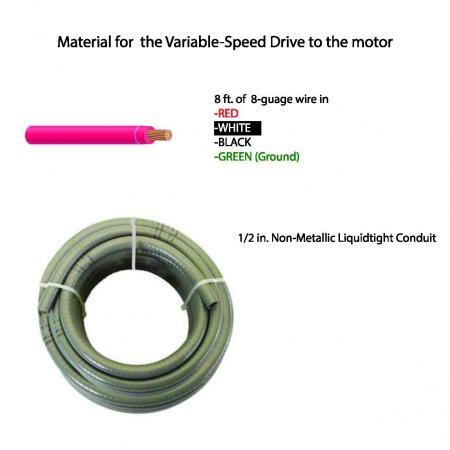 - 8 feet of 8-gauge electrical wire GREEN (Green is always ground, remember that). (Hardware stores usually sell wire by the foot or yard). 8 feet of non-metal liquid-tight conduit to thread the wire through. This material would connect the VSD to the motor. 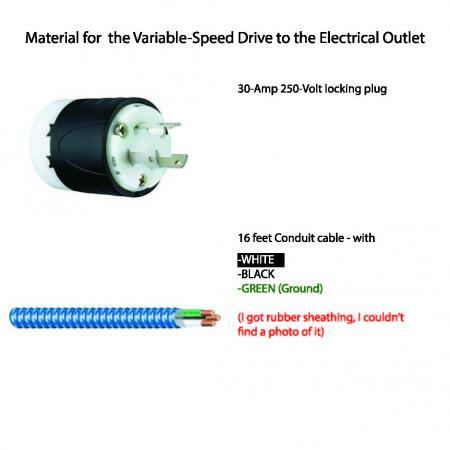 - 16 feet of 220V electrical, with black, green and white wiring. I also bought electrical tape. - hacksaw (to make a mounting for the VSD to the C&P press). - 3 cups of strong coffee. I’ll continue Part 3 in a day or two. (Sorry these posts take so long, each one is about an hour-and-a half of making sure I have the right photos, research, etc.). #8 wire seems awfully big for a motor to a C&P press. What is the size of the press and what is the amp rating on the motor plate? Generally speaking, #8 THHN/THWN wire is good for 40 amps minimum (see attached info below for more detail), and I would be surprised if your motor rating calls for 40 amps. If you find that you can legally use smaller wire than #8, that would probably be the easiest way out of your problem. Smaller wire will be easier to hook up, as well. (Disclaimer: I’m not an electrician either, and my comments are merely meant to help you find definitive information to make your own informed decision, not to tell you what to do). Yeah, I could be wrong. I’ll double check and correct the post if I need to at a later date. Thanks for the comment! Geoffrey, Not too many people ( do it yourself Electricians) take the time to look up requirements for device installations. That is nice to see. I understand why people attempt their own work, especially business owners. They are number crunchers and Budget beaters but that doesn’t dismiss the fact that it is ILLEGAL and NOT SAFE to do so. All states that require Licensed Electricians, it is an arrest-able offence to perform work without a License and/or a Permit. Especially California. That Jurisdiction has some of the most strict laws in the nation next to Mass and RI. Do it yourself electricians should read their Insurance Policies on your, businesses, buildings and homes before attempting to perform your own work. There is a section that states, ILLEGAL work performed, without the proper permitting and documentation, on dwelling will NOT BE COVERED BY THE INSURANCE PROVIDER. With that being explained, is it really cost effective to perform your own work opposed to hiring the proper professional to cover your interest? Disclaimer - I am a Master Electrician/Electrical Engineer! My professional advice to everyone is to hire a qualified electrician. I call it, safe and inexpensive additional insurance coverage. The disclaimers and Geoffrey’s research is the only sensible information on this post. petspo1, well said! I completely agree with you, and everyone should take your advice. I’m interested to see if anyone else has any comments for this post. There is nothing more to add, Electricity is not that complicated, BUT must be done right and conform to Local Law and Regulations and follow Federal Guidelines. The National Electric Code has been adopted by all 50 states and depending on the state or region, that code can be amended, rejected, etc by local jurisdictions. In my state of Colorado, the state enforces the code through a network of state electrical inspectors and a permit system. The only federal jurisdiction I have come in contact with is work inspected by MSHA, under the federal mine safety act, and that covers all mining activity not covered by the NEC. And the NEC is written by a private trade organization and has nothing to do with the feds. There are other exceptions like public utilities. In practice, even licensed electricians do a lot of wiring work without permits that is never inspected by a local or state inspector. My initial reaction to Docs Coffee posting was that he would be better off hiring someone who knew what they were doing. It’s really a very minor wiring job, but clearly not in Doc’s comfort or knowledge zone. I guess Virginia isn’t one of those states — I did the complete rough and finished electrical wiring of the house I built for myself, including hooking up the ground-source heat pump and thermostat, and it all was approved by the electrical inspector. I’ve also designed, built, installed, and maintained electrically-operated hands-on exhibits at a major US science center without any question. Nobody died. Here is a very informative link to rules and regulations for electrician license requirements. Mike Holt is one of the most recognized educators, so much so, Jurisdictions have standardized some of his recommendations. This is a great website for those do it yourself electricians that may have any questions to requirements. Bob, I recently performed some work in VA. Presently, They do require a electricians license to perform the work and a Masters to pull a permit, perhaps when you built your home, VA had the NY approached, right to work state. Home owners are allowed to perform their own work providing they follow the Jurisdictional rules. I took that test to become qualified in VA to pull a permit. The 26 other Master Licenses I hold was not enough proof to reciprocate to VA. Typical of local governments. Everyone, please be careful and cautious if you do decide to perform your own work. Some think its easy, if it was, there would be no need for licenses and the strict educational requirements to become a electrician.